Sometime in the next 5 billion years, our Milky Way galaxy will smash into the Andromeda galaxy. This galaxy is our nearest neighbour, a mere 2.5 million light years away—practically intergalactic spitting distance. What will happen when these giants collide depends on which galaxy's packing the most weight. 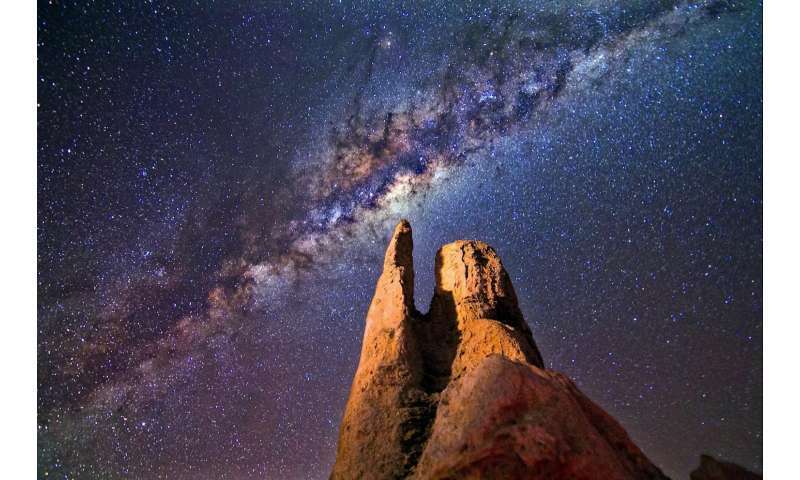 "We used to think the Andromeda galaxy was three to four times larger than the Milky Way," says Dr. Prajwal Kafle, an astrophysicist with the UWA node of the International Centre for Radio Astronomy Research. "If you look in any textbook, that's what you'll see." Well, the textbooks need updating. "We discovered the weight of Andromeda galaxy is almost on par with the weight of the Milky Way galaxy," Prajwal says. This smaller estimate doesn't mean the galaxy contains fewer stars. Instead, we're reducing how much dark matter we think it contains. Dark matter is a mysterious invisible contributor to a galaxy's weight. We don't know what it is, but thanks to US scientist Vera Rubin, we know it's there. "Vera Rubin established the existence of dark matter in the 1970s," says Prajwal. She worked out that what we can see of the Andromeda galaxy simply isn't enough to cause the gravity we know is acting on the system. In fact, we can only see around 10% of the galaxy. The rest is dark matter. "Dark matter is very mysterious," Prajwal says. "If anyone could find out what exactly that dark matter is … well, a Nobel Prize is waiting, everyone knows that." To work out how much a galaxy weighs, you can calculate how fast you'd need to travel to escape its gravitational pull. The higher the speed, the greater the gravitational pull. The greater the pull, the heavier the galaxy. To escape the Milky Way, you'd need to be travelling at 550km/s. This means our galaxy weighs in at around 800 billion times the mass of our Sun. And now we know the Andromeda galaxy is about the same. This new estimate changes our understanding of how the Andromeda galaxy formed, how it is evolving and how it interacts with other galaxies. It also informs what we know about our own galaxy. "We don't know how our galaxy looks from the outside, so looking at Andromeda is the best way for us to see what it might look like." What doesn't change is the inevitability of a clash between the Milky Way and Andromeda. Do we need to be worried? "Yes, you should be really worried if you are going to live for the next 5 billion years," Prajwal laughs. "Otherwise, I think, no." Do colliding Galaxies actually collide if there is no one to witness it? The Sun will have long engulfed us by the time Andromeda and The Milky Way mess each other up. It was Fritz Zwicky who established (and named) the existed on DM in the 1930's, but like Fred Hoyle, he seemed to annoy people by being smarter than them. Irritating scientists (and sassy women) do not get Nobel prizes, which ironically isn't very noble of the committee. Interesting @someone. I didn't know about Zwicky and his "Dunkle Materie" theory in 1933. Fritz Zwicky calculated the gravitational mass of the Coma galaxy cluster within the cluster and obtained a value at least 400 times greater than their luminosity, implying there is matter that is not visible. At least he's calling what it is "unseen matter" he does not seem to be endowing it with magical properties. Now Fritz Zwicky has put meat on the bones, the "Coma galaxy cluster" is 10Lys radius, 323million Lys distant, containing a 1000 galaxies. Well that problematic and only on 5th sentence; a 1000 galaxies in 10Lys, which being small and dwarf galaxies opens up all sorts of unforeseen consequences, namely how did Fritz Zwicky calculate the mass of all the almost unseen galaxies then compare the luminosity to the total mass of galaxies and conclude the mass is unseen coining the phrase darkmatter. Small galaxies are not as luminous as their mass suggests, there is no darkmatter! The small galaxies are more massive than their luminosity, where their luminosity is the total amount of energy emitted by the stars in the galaxies which is their luminosity. The total output of the galaxy is directly related to the luminosity of its stars. As we have just seen, the luminosity is not related to the mass of the stars as Fritz Zwicky has just shown because he obtained 400 times more gravitational mass than luminosity in other words the stars are emitting 1/400 of their total energy output, and consequently the stars are not luminous and difficult if not impossible to see coining the phrase darkmatter. He was not creating additional matter, he was stating a fact; he measured but could not see the mass he had just measured, for want of better description, he called it darkmatter! What's is odd is no one seems to take into account the central black hole of the Andromeda galaxy which is much more massive than the relatively puny one at the center of the Milky Way. Not only that, Andromeda's satellite galaxy M-32 a dwarf spheroidal galaxy, has a more massive central black hole than the Milky Way. I'd imagine that if described in terms of some sort of fight, since black holes are the thing that holds a galaxy together, when all is said and done, the Andromeda will decide the fate of the new galaxy created by the collision. Our central black hole is simply too small to challenge it's black hole. @granville583762, yes it's about 100 times more mass as we now know not 400. However I think the mass is established by the fact of the speed that the galaxies are moving and that the Coma cluster should be flying apart if there was not DM. There's mini blackholes popping up all the time coalescing into larger blackholes, in 5billion year's Andromeda and the Milky Way's blackholes will be indistinguishable from each other. Andromeda and the Milky Way are two average galaxies going through the process of merging, the untold countless numbers of blackholes count as unseen matter, their credentials fully qualify them to be paid up members of the darkmatter club, they do very best to comply with the strict entry requirements envisaged by Fitz Zwicky. To date what is the total mass of blackholes added to the darkmatter tally. 400 down to 100 is a very large percentage drop, Zwicky calculated the total mass and it was more than its luminosity. He could not visually see the calculated the mass, he measured its effects so it is not dark as it is visible for the purposes of Newtonian physics measuring gravitational mass's effects on gravitational mass, it was not invisible, it was not darkmatter as it was visible. someone11235813:- @granville583762, yes it's about 100 times more mass as we now know not 400. However I think the mass is established by the fact of the speed that the galaxies are moving and that the Coma cluster should be flying apart if there was not DM. @granville583762, what you have said makes no sense, if dark matter was a substance that did not have any effects at all including gravitation effects then it would not exist. Dark matter is called such because it can only be inferred precisely because of its interaction with gravity. And it's more General Relativity than Newtonian due to gravitational lensing.